Based in West Bromwich, we provide professional wasp pest control services across Birmingham, Sandwell, and Walsall. 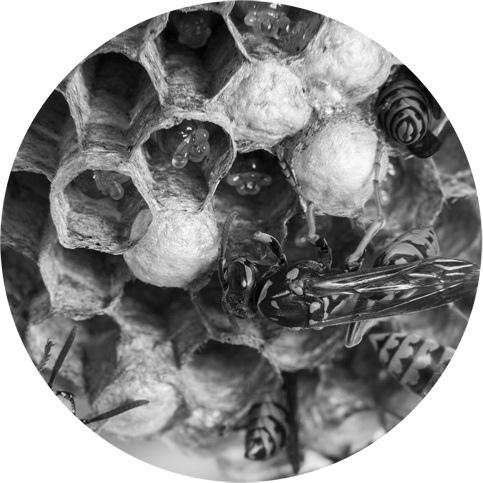 Each wasp nest is a series of horizontal combs completely surrounded by a paper envelope with concentric markings. Initially, the solitary queen has to forage for food, construct the brood cells and when the wasp nest is about the size of a ping pong ball she lays her eggs, feeds the developing larvae and defends the nest. When the first offspring emerge as adults they assume all tasks except egg laying. These sterile females are called workers and are noticeably smaller than the queen. The queen devotes the remainder of her life to just laying eggs and does not leave the nest again. It is imperative that if you see any signs of a wasp control problem that you act quickly to eradicate this before it becomes a major problem. A large amount of the work we do to eradicate wasp problems takes place in August and September when workers have completed building their nest and seek out sweet foods. However, many problems can be prevented proactively by identifying nest premises in May, June or July before the nests are completed and can hold up to 10,000 wasps. During this period wasps are likely to be less aggressive towards you. Our wasp pest control service involves our professional pest controllers applying specialist insecticide at the entrance to the nest. Wasps entering the nest are then contaminated with the powder or liquid. This insecticide is biodegradable and is not toxic to other species, so the environmental impact of our work is carefully considered and managed. If you are at home then ensure pets and children remain away from the nest. If you are concerned about wasps or hornets inside your home then our wasp exterminators can contact you by mobile when they are near your premises, allowing you to leave the house safely right away, until they are with you.